previous post: An understanding of MMT can energise the progressive fight back. Today we learned that – China posts slowest GDP growth in two years – yes, the annual rate of growth has dropped to 9.1 per cent which was 0.4 per cent lower than the second-quarter and 0.2 per cent lower than the estimate provided by the Bloomberg News survey of 22 economists. The reason given for the “slowdown” was “monetary tightening and weaker export demand”. The anticipation of a slowdown over the last week has fuelled a host of doomsday projections about how the Chinese investment boom will crash and how it will cripple the rest of the world. My view is different. I consider the Chinese government to be totally on top of managing their economy, which sets them apart from the leaders in the advanced world. They will not let a major economic crisis occurring within their own borders. They have so much more scope to expand although all of us will rue the environment impacts of that expansion. Their problems are going to political – taming an increasingly rowdy middle class. For the rest of us, China provides an economic example – when all other sources of expenditure fail, turn on public spending and do it quickly and don’t err on the conservative side. China’s efforts to prop up economic growth won’t help it escape the hard landing that will probably arrive in 2013 or 2014, said Nouriel Roubini. Nouriel Roubini was quoted as saying that the prospect of a soft landing in China was “mission impossible” because “Over-investment “always” leads to a hard landing”. He would have been wiser saying nearly always because China will prove to be the exception. There is a lot of misinformation about China that spreads across the world media each day. A few months ago there was the obsessive worries about the Chinese dumping their strategy of buying US government bonds with their trade surpluses and sending the latter broke. There is also the constant chatter about it artificially deprecating its own exchange rate because it wants to maintain its export-led growth. That presumes, of-course that exports drive its growth. Please read my blog – China is not the problem – for more discussion on this point. Roubini’s observation that investment booms always unfold is generally correct but in the case of China it is unlikely to be the case. All these misinformed commentaries reflect a failure to give much credit to the Chinese for understanding the characteristics of their fiat monetary system and the opportunities that being the monopoly-issuer of currency within that system presents the Chinese government. There is no doubt in my mind that the Chinese are much smarter than the Western politicians. I agree that some of this “smartness” might just be the fact that they are subject to less political constraints – the type of which are paralysing the governments in the advanced world. But the very fact that these constraints are operating in this way in the advanced world is testimony of how stupid our politicians are – on all sides of politics. It seems that the commentators apply the flawed “Western” (that is, neo-liberal infested) logic to all governments. But the Chinese government has shown that it is less willing to abide by the neo-liberal narrative and its performance during the crisis is clearly testimony to that. We cannot assume that the Chinese are as stupid as we are in dealing with economic policy. As an aside, Roubini’s point relates in part to the old “knife-edge” problem that Roy Harrod identified in the early years of Keynesian growth theory (Roy F. Harrod (1939) An Essay in Dynamic Theory‘, Economic Journal, 49, 14–33.). The fact is that Marx identified this problem (the “realisation” problem) in the previous century which is where Harrod’s contemporary Evsey Domar came upon the same ideas and produced a similar growth model around the same time but independently of Harrod (publication 1946). That is why you will see the work referred to as the Harrod-Domar model. I will spare you the mathematical derivation and the conceptual complexities. The idea is relatively simple. An acceleration in the rate of capital accumulation (which is investment as a flow adding to the capital stock) adds to demand (spending) in the current period but adds to productive capacity in future periods. When an economy has idle resources it doesn’t matter much whether the the addition to demand outstrips the additional productive capacity. The economy will still grow and absorb the idle resources into productive pursuits. However, once the economy reaches full employment the situation becomes different and the growth process proceeds on what Harrod called a knife-edge path. Under the Harrod-Domar model, there is a precise rate of investment which is compatible with full employment given other growth in spending (government, net exports, consumption). Investment increases the productive capacity of the economy which then changes the output level. Harrod-Domar defined a “steady-state” growth as aggregate spending growing at the same rate that real capacity grows. In Modern Monetary Theory (MMT) this is, of-course, the non-inflationary rate of growth in nominal spending. If actual real GDP growth driven by spending is less than the growth in productive capacity from the previous period, then Harrod concluded that the current period of investment the economy has created excess productive capacity. In the previous period, the firms predicted that aggregate demand (spending) was going to be more than it turned out to be and so have “over-invested”. The dynamic is clear – next period they will invest less which in turn reduces aggregate demand again and this means that further excess productive capacity is created in the economy. The alternative case occurs in a growth phase, if real output growth is greater than the warranted rate of growth then nominal spending growth outstrips the real productive capacity of the economy. Firms chasing market share will, if they think that demand growth is likely to be sustained will then start investing in more productive capacity, which, of-course, drives aggregate spending faster – and ahead of the capacity growth. So investment in this period creates productive capacity that has to be utilised next period via spending growth. If consumption growth is relatively stable, and government spending and net exports unresponsive, then clearly the economy walks along this knife-edge with demand always one step ahead of supply and investment has to keep growing. Eventually as confidence falters etc, investment stalls and the downward spiral results. This is the context in which Nouriel Roubini is considering the over-investment (in productive capacity) (nearly) always leads to a crash. It is clear that in most nations, steady-state growth is unstable as the economy teeters on either side of the “knife”. But in China’s case I don’t think we can conclude that they are close to this dilemma yet. For a start they have huge quantities of idle labour resources which can be brought into production from agriculture. They are still in what Arthur Lewis called surplus development phase whereby the productive (capitalist) sector developed by absorbing “surplus” labour from the non-developed subsistence sector. See classic paper – Arthur W. Lewis (1954) ‘Economic Development with Unlimited Supplies of Labor’, Manchester School of Economic and Social Studies, 22, 139-91. Productivity in both sectors would increase and expansion could occur without having to place unreasonable pressures on real wages growth. The other major difference between the world that Harrod and Domar imagined (and studied) and China is that the latter operates a fiat monetary system where the Chinese government is the currency issuer and they demonstrated during the early stages of the crisis that they know exactly what they are doing with respect to using that monetary supremacy to maintain growth as one component of spending collapses. But there is so much idle capacity (human capital being the primary manifestation of that) in China that they can “go it alone” without growth from exports should the situation arise. Their domestic market potential is massive and the Chinese government knows how to use its monetary capacity to exploit that when the need emerges. They sailed through the global crisis even though exports fell dramatically. In this blog – Where the crisis means death! – I discussed the response of the Chinese government to the onset of the crisis and the sharp decline in their export revenue as spending in the advanced nations collapsed. 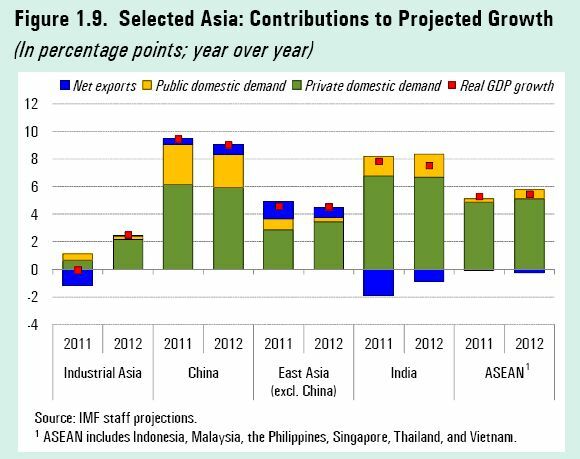 The IMFs Regional Economic Outlook: Asia and Pacific Report produced the following graph. It split the contribution to growth of public demand (net government spending), private demand and net exports for some selected Asian nations. China stands out. Most people think of China’s growth coming from its burgeoning export sector. But it has a very strong domestic economy and a large public spending program. So the graph highlighted in the early stages of the crisis the importance of very large fiscal interventions. My Chinese contacts informed me that at the time there was no discussion over there about the country drowning in debt or that the government was going to “run out of money”. These ideas that crippled the recovery in the West were not allowed to germinate in China. Presumably, as more US-trained PhD students go back to China with there nonsensical economic theories things will change. But at this time, the Chinese government behaved impeccably. They demonstrated a confidence in their knowledge that they are sovereign in their own currency and can deficit spend to further their sense of public purpose. We might deviate (dispute) what they define as purposeful behaviour and I certainly don’t suggest that all the policies of the Chinese government are sound. They are clearly not! But they do have a much more sophisticated understanding of the opportunities that they have as a monopoly supplier of their currency than our Government has. And they are taking those opportunities more than other nations around them that are caught in and are being choked by the neo-liberal web imposed on them by the advanced nations. That is why I think Nouriel Roubini is going to be proven wrong in his forecast that the growth rate will collapse in China. Then consider this (infuriating) Sydney Morning Herald article (October 16, 2011) – Is the dragon running out of puff? – which is representative of the sort of erroneous China-analysis that fills up our media pages. No economy that trades is immune to the developments of their trading partners and certainly export revenue can fall sharply which creates some possible dislocation for the domestic economic activity. But to infer that China will be “cash-strapped” is a lie. It doesn’t need export revenue to grow its domestic economy. The Chinese government has all the “cash” it will ever need to mobilise domestic demand should export revenue collapse. NEWS that the economic turmoil in Europe is severely affecting Chinese exports has set alarm bells ringing in Australia. The logic goes that if Chinese exports are crunched so will be Chinese demand for the Australian resources needed to make these exports. This resource demand is driving the fast part of Australia’s two-speed economy – the other part being pretty much in neutral. On that basis then, if Europe collapses, or the US runs off the rails, Australia could quickly return to a one-speed economy – that one speed being not very fast at all. First, when the global financial crisis hit and quickly spread into the real economy (because governments didn’t use their fiscal capacity sufficiently to insulate the latter), the terms of trade fell. But as the Chinese government redirected demand quickly into domestic expansion the demand for primary commodities recovered quickly and our terms of trade also recovered. Second, should China’s exports collapse because the leaders of the West undermine the growth of their own economies as a result of their sheer incompetence and ideological bloody-mindedness, then China will further redirect spending to its domestic economy. They have a very large and mostly undeveloped land mass and have proven experts at building new public education institutions, state-of-the-art public transport systems and the creation of new urban infrastructure including housing. They have a long way to go in that process. The only problem for the West will be the way in which this development process changes the world demand for energy resources. I cover the dilemma in this blog – Be careful what we wish for …. I believe that in the next 20-30 years there will be a fundamental shift in energy use and the working classes in the now advanced world will be priced out of motor car use and the like. Third, if Australia’s mining boom collapses (noting that net exports currently do not make a positive contribution to real GDP growth at the moment) then if the Australian economy stagnates the cause will not be China. Any slowdown as a consequence of the change in the composition of aggregate demand will reflect the failure of the Australian government to use its fiscal capacity to ensure that rising non-government spending gaps are not filled with net public spending. If Australia joins the rest of the world in stagnating because our politicians fall prey to the ideological that they have “run out of money” then it is their incompetence and nothing to do with China. It is highly likely that our budget surplus obsessed government will fall into that trap such is their appalling conceptualisation of responsible macroeconomic policy management. They seem to believe that they have used up all their “expansionary bullets” and now must save again (in their language – run budget surpluses). A budget surplus does not lead to increased national saving – it actually squeezes the wealth of the non-government sector and so reduces national saving. The concept of saving in one’s own currency is nonsensical. Saving is the act by which a user of the currency postpones consumption now to provide for greater consumption later. This “sacrifice” is required because the non-government sector has to finance all of its spending in one way or another. The sovereign currency-issuing government never needs to store up currency in order to spend. It can spend its own currency whenever it wants irrespective of what it did last period as long as there are goods and services available for purchase in that currency. To put a finer point on this idea that if the (self-inflicted) stagnation in Europe and the US is killing China’s growth potential consider the latest IMF Regional Economic Outlook – Asia and Pacific which was published this week (October 2011). The following graph reproduces Figure 1.9 in that publication and shows the contributions to real GDP growth (2011 and projected) by spending component – that is, next exports, public demand, private domestic spending (consumption and investment). It is clear that the main driver of real GDP growth is as it was in the early years of the crisis (see graph above) – domestic demand. Net exports contribute a small component of real GDP growth which puts the popular conception that China is an export-led economy into an entirely different light. It is not. The Chinese government is using public spending to achieve strong domestic growth with provides income growth (and rising savings) to the private sector which, in turn, spawns strong private domestic growth. An almost blueprinted fiscal strategy. If the West followed this pattern and eschewed all the ideological baggage that neo-liberalism has dropped on us then we could very quickly look like this. We would run out of idle resources before China but at present the West has mountains of idle labour – millions of people desperate for work – that should be absorbed back into productive employment. We are not doing this because we are stupid. Industrial production increased 13.8 per cent in September from a year earlier … Fixed-asset investment excluding rural households climbed 24.9 per cent in the first nine months … Companies including BASF SE, the world’s largest chemicals company, are expanding in China as higher wages and consumption boost demand. The German company and China Petroleum & Chemical Corp this month completed an expansion of an ethylene plant in the eastern city of Nanjing. China’s retail sales expanded 17.7 per cent after a 17 per cent increase in August. These are figures that are beyond the imagination of the West. We think 3 per cent growth in retail sales is sound. The problem that China needs to manage is inflation. The Government has to divert domestic resources out of some sectors (probably housing) and continue to fund productive capacity augmentation. The slight slowdown is testament to the fact that monetary authorities in China have been increasing interest rates (five increases in the last 12 months) and placed lending limits on home owners etc. The reports I read from China tell me that most analysts consider the inflation rate will drop sharply in the coming year. Whenever I read a story about China I realise that the West is so infested with neo-liberalism that it has forgotten how a fiat monetary system actually operates and the opportunities such a system affords a government which issues the currency. China faces different political constraints to the West and that might explain why they seem capable of exploiting those opportunities while the leaders in West spend all their time denying they have them. I also like to think that the Chinese are smart. I don’t know that definitely. What I do know is that the leaders of the West are stupid. you really need to talk about the elephant in the room, china’s housing bubble. i also think you are underestimating the amount of infrastructure that needs to be built to switch to a consumption-society and the amount of human capital transfers (and enclosure-esque proletariat-creation) that need to happen before peasants can easily transition to becoming industrial producers. There’s a very interesting paper by the St. Louis Fed on China’s Foreign Reserves. The case is made that China’s exports are the result of very large domestic savings (mainly by consumers) which keep imports growth lower than the exports growth. High domestic savings are attributed to lack of social safety nets and severely underdeveloped insurance and financial markets. For instance “the majority of the Chinese population is not effectively covered by any form of health care insurance system”. If that is the case, creating a robust and all-inclusive social safety net (health, education, pensions) would be highly beneficial for China’s domestic demand. Development of private insurance and financial markets would also be helpful in order to provide an alternative venue for domestic savings investment (instead of simple bank accounts). Also, it would be interesting to know the size of domestic Chinese middle class. A large part of its industrial base is targeted towards the Western middle class needs. If foreign demand dropped significantly, depending on the composition of domestic demand (especially for expensive durable goods), there might be structural employment problems which would require labor changing sectors completely (from industry to construction/public sector for instance). In any case though it seems that domestic private and public demand can sustain a 8% growth (depending on commodity/energy availability). You say “I consider the Chinese government to be totally on top of managing their economy”. Well, they are managing the economy using a particular industrial policy – one which promotes investment and exports. In order to do this they, among other policies, suppress wages in order to increase international competitiveness, mainly by parking their overseas earnings in foreign government bonds so that they don’t recirculate back to the home economy. In fact since the economic crisis, the investment share of GDP has INcreased while the consumption share has DEcreased. These two contributions are lumped together as ‘private domestic domand’ in your graphs. You are correct when you say that the economy needs to shift to one of greater personal consumption, but as yet there is little evidence to show that the political leadership in China believes that this is necessary, or has the will to implement such a policy shift. You would “like to think that the Chinese are smart”. We shall see. BTW hardest anti-spam question ever, today (8+8). I ran out of fingers! Interestingly the Chinese government doesn’t seem to bother too much in using government created money to pay off the recurring debts of inefficient state enterprises. Presumably it’s seen that for the time being the employment they provide is worth higher prices to prevent social unrest. Bill, I think you are on somewhat shakey ground here. Unless the system changes its working habits beyond recognition, which is entirely possible, what is more likely is that the motor car as we know it will become obsolete, if it isn’t already, and replaced by another, different, kind of individual transport mechanism. I don’t see the grounds for the elimination of individual transport in your time frame, although this is more than time enough for a change in the nature of this transport. According to this article there is labour shortage? “Big companies are churning out record profits, well in excess of analyst estimates, while small company profits are falling, with many facing bankruptcy. . . .
China has the dubious “advantage” of a dictatorial regime.This regime also appears to be extremely corrupt.These 2 factors alone would put any good outcomes in the Chinese future in doubt. More importantly,China has a catastrophic overpopulation problem combined with,and related to, catastrophic environmental damage.They have been exporting their population problem for a long time and are continuing to do so.They are now engaged in exporting the environmental damage part of ther system and culture. China is not a good example for anything positive.China will fail,spectacularly.If the West doesn’t wake up to fixing its own problems it will likely be dragged down with China. This is a great article and our decision makers should be obliged to read it. In my opinion obviously that fallen system was ditched but there are strong elements of market socialism present in China – what looks like private ownership of means of production is actually only private custody of the property effectively belonging to the state (administered by the Party). No decision can be made without a tacit approval of the Party commissioner. (See W. Brus, K. Laski “From Marx to the market” – obviously available for download from the Chinese file sharing sites). The main threat to the system could indeed be emancipation of the “middle class” that is attempts to clarify property law and introduce the Western legal and political system in general. Then the plutocracy may make attempts to bend rules in their favour. What initially looks like “one person-one vote” quickly becomes “one dollar-one vote”. This is not going to happen soon at least not during the tenure of the next generation of the leaders. The memories of the absolute failure of Perestroika and the second “great smuta” (Smutnoe Vremia) in Russia which followed (the Yeltsin’s era) are very strong. The attempts to introduce similar democratic reforms in 1989 ended in the stand-off at Tienanmen Square. The Chinese are not stupid. They will not repeat that mistake again. I don’t think that the housing bubble burst will do any harm to China. I asked that question to my Chinese colleague and in his view the majority of people will be extremely happy to see the prices going down. Very few will show any sympathy to the greedy investors (speculators) who burn their fingers. The key point is that major commercial banks are state-owned and therefore can be easily “fixed” without too much moral hazard and causing social indignation if their assets (bad loans) have to be written off. This happened already once in the past more than 10 years ago. I fully agree cars as we know them now are not sustainable and new vehicles will not evolve from them. The reason is mainly the weight of the metal which is needed to provide strength required for safety reasons. That’s why electric cars are even more expensive. In China people use electric scooters/mopeds. A few of them have been imported to Australia as well. What we have to do here is to rethink the road network and separate bikes/light electric vehicles from heavy vehicles/trucks/buses. This might be anecdotal evidence but I saw such a solution in China during a brief visit a few years ago – extra lanes divided from the main road. Anyway we can learn a lot… but are we smart enough? those authors do not understand how China keeps its currency pegged: it buys foreign currencies on foreign exchange and stores them up in reserves. Nathan Tankus:I also think you are underestimating the amount of infrastructure that needs to be built to switch to a consumption-society and the amount of human capital transfers (and enclosure-esque proletariat-creation) that need to happen before peasants can easily transition to becoming industrial producers.China has been doing these things for decades & has become expert in it as Bill notes – and he points out that there is still a ways to go. I think the knife-edge is when there is no longer room to do this. “But in China’s case I don’t think we can conclude that they are close to this dilemma yet.” So your underestimation argument bolsters Bill’s bullishness. Podargus:This regime also appears to be extremely corrupt. Compared to the disgusting, corrupt USA predator oligarchs & parties, who have been brutally class-warring on their own people & the rest of the world for decades, the Chinese elite are pure-minded incorruptible revolutionary saints who do nothing but suffer in advancement of the People. So your snot can turn black in Beijing. Not so different from Pittsburgh at the height of the USA’s industrial supremacy. The Chinese understand economics enough to create the real wealth needed to deal with their environmental problems. My wife & I have been about the second most bullish-on-China people that I’ve ever heard of since we were in Chinese class in high school back in the 70s. And China has exceeded our expectations. The most bullish was a Prof friend of our teacher then, who projected that China would be about where it will be ten years from now – by the 90s. Now, that was a bit crazy. Great article. But I think you only touched on the really the big issue. Inflation. MMT teaches us there is no free lunch with a fiat monetary system (despite what its detractors say). Money does not equal wealth and the true cost of “wasteful spending” is inflation. This is a big problem in a country where many citizens spend as much as 80% of income on basic necessities. I agree with much of your post. China most definitely understand the benefits of being a sole issuer of its own currency. However, in future posts, I would love to hear your thoughts on the inflation issue. i think you missed my point. bill said “For a start they have huge quantities of idle labour resources which can be brought into production from agriculture.” my point was to directly contradict this line of thinking. idle labour resources can’t just be “brought in”. they need to not have independent means of subsistence (ie there own land) and they need a sufficient amount of human capital to be able to smoothly go to industrial production. without that there will be full employment style inflationary pressure even with idle labor resources. bill said “It is clear that if investment slows, then the rate of accumulation of capital slows, and the growth in future productive capacity falls. So we might expect as China attempts to engineer a more or less orderly shift from capacity building to domestic consumption that its phenomenal growth rates (above 8 or 9 per cent) will taper somewhat. my point was that to shift to domestic consumption you need infrastructure. big box stores, transportation systems, commercial areas etc. bill simply assumes that the infrastructure will be there or it won’t be difficult to put in place in a hurry. i’m not so sure. No, I slid around the point. The problem is not “the amount of infrastructure that needs to be built”, but the difficulty of building it. The dispute is about Chinese expertise & ability to do it smoothly & quickly enough to offset demand shortfalls elsewhere. I’m with Bill – they can build it. They have the technology. Including the social technology of non-insane economics, now lost to the inscrutable, stagnant, unchanging West. And they have been doing such things for a long time. @dnm: One thing that Michael Pettis left out was the contributions to GDP from 1985. Investment contribution to China’s GDP had been at 45% since 1985! The big 3 economic powers, USA, Japan and Germany, had been investing at half of China’s rate. And China had been gaining global output share from the Big 3 since 1985. Thus I think Prof Mitchell’s understanding of China’s situation, with the knife’s edge analogy, is more correct than Prof Pettis’ gloomy forecasts. 1) Either spend the money very quickly and wrecklessly as a result, which results in a massive overcapacity of things; imagine the U.S. government deciding to build a couple of hundred aircraft carriers for the Navy, and thousands of new skyscrapers and malls; while this is occurring, then yes, it can give the illusion of economic growth, but once built, you’re stuck with a lot of debt and a bunch of overcapacity (which if anything, if done in things like real-estate, can cause property prices to collapse even moreso). 2) Spend the money in a careful and productive manner, but this requires taking the time to figure out things like how, where, and on what exactly, to spend the money. This means the money gets put out by the government too slowly. This is how the Western economies attempt it. In addition, unlike in China, in the Western world, there is the issue of people and their property and the environment. You can’t just engage in building a bunch of new highways and so forth like in China, where there is no concern for the effects on the environment, if people have land, they are kicked off of it by force, and there is also little quality control regarding the quality of the infrastructure built (the latest example is the Shanghai garbage bridge, a bridge literally made out of garbage it turns out). The Chinese engaged in a massive amount of stimulus spending which has given the illusion of economic growth for the time being because they are afraid of civil unrest. But after a certain point, the piper will have to be paid and the laws of economics will take over. Their infrastructure building also further creates an illusion of economic growth because so much of it is low-quality. The West faced the same confusion over the Soviet Union’s GDP growth. Yes, it produced a lot of machinery and vehicles and so forth, but it was all extremely low-quality, and essentially worthless as a result. The Chinese also have one advantage in terms of trying a stimulus, which is that they do not have to run a deficit right now due ot their large reserves. This means that unlike the Western nations, they do not have the problem of adding debt for the stimulus spending, which means they don’t have to worry about the additional debt hamstringing their economic growth. The OP seems completely oblivious to the concern over increasing the debt in the the Western countries. Debt is a serious problem. Once a country’s debt gets to be about 90% of its GDP, approximately, it suffers from lackluster economic growth. And debt must be serviced. Make the debt too large and one small uptick in the interest rate can massively increase the amount of money it takes to service the debt. Japan spent half their GDP on fiscal stimulus and now has a debt of 230% of their GDP. If their interest rate was to increase by one percentage point, it would wipe out whole sectors of the Japanese government because of how much servicing the debt would increase. So it is wrong to claim that the solution to an economic recession is to just engage in massive spending, very quickly, without regard for things like deficits or debt. There is a limit on how much money the Chinese government can spend to prop up their economy. Like any economy, they are still subject to the laws of economics. This would be akin to saying that the Soviet Union faced no limit on how much money it was able to spend on its military because it was a socialist dictatorship. Yes, it was, but it still was limited in what it could spend. China right now is going through what I nickname the “Economic Invincibility” stage, the period of all up-and-coming economies (and even economies that have been thriving for a long time), whereby they can give off the aura that they are invincible, and that their government has created a new “model” of economy that is superior. The laws of economics do not apply to them, supposedly. It happened with the Soviet Union. It happened with Japan. It happened with South Korea. It happened with Dubai. It happaned even with the United States as the U.S. had been experiencing such a great economy with low inflation and low unemployment overall for such a long time. Actually, it happened twice. First in the late 1990s, with the Dot Com bubble, whereby we had supposedly reached a new era with a “New Economy,” whereby the old rules of running companies and investing did not apply anymore. Then in I think 2006, you had Ben Bernanke giving a speech discussing how we had reached a “new era” in macroeconomics, how our economy had advanced to the point of where major recessions were a thing of the past, blah blah blah and then BOOM! the housing bubble bursts, then the credit crunch and the financial crash. Now it is China that everyone sees as the “new model,” with its “state capitalism” or “market socialism,” that is claimed to be (AGAIN) above the laws of economics. The laws of economics say one thing, but the Chinese govenrment says something else, therefore, the Chinese government dictates how the economy will go, blah blah blah they will have a blowup at some point just like everyone else. But China suffers from the problems of inefficiency (via its state-owned enterprises), corruption (via its dictatorial system and state-owned enterprises—the Soviet economy for example was notoriously corrupt)), misallocation of capital (this due to the corruption), major demographic problems, major environmental problems, and problems such as considering only the short-term, and not the long-term. There is a perception that the Western countries, with our chaotic democratic systems of government, only focus on the short-term, whereas the Chinese, with their dictatorial regime, are able to focus on the long-term. This is flat-out false. Their enactment of such a massive stimulus unto itself undoes this argument. China, if it truly was concerned about the long-term, and didn’t have to worry about major unrest, should have just let their economy sink along with the other economies, cycle through the recession, and then recover on its own. But they didn’t do that. They took the short-term solution of massive spending. Another example of the short-term mentality is that many of the provincial and local Chinese governments have economic growth targets that they must meet. If they cannot do this through actual economic growth, they do it through property and infrastructure development (which is very questionable as growth). This, again, is a short-term mentality. These governments should not have to meet such growth targets. That is why they are indebted so much now, to the point that the central government may have to assume their debts and bail them out. What really gets me is how people look to China as the anchor to pull the global economy out of the recession. Seriously, how? China lacks the domestic demand to support ITS OWN economy, let alone the global economy. All the demand coming from China right now, that is helping prop up other countries’ economies (such as Canada and Australia), is ultimately tied to the Chinese government spending a bunch of money, which is an artificial form of demand because it has its limits. It isn’t private-sector demand, from wealth generated by the private sector, it is government demand, which means the government is relying on the reserves it has built up or is taking on debt or taxing. But no government creates wealth to spend. It can run a debt up for awhile, it can make money via exporting things like, or it must tax its private-sector to get the money. Now if the Chinese government had not had to enact any massive stimulus, if their level of domestic demand was literally large enough to continue to drive the growth of their own economy AND drive the growth of many of the other economies in the world, then that would be a real mark of a truly strong economy, a true global economic anchor. But China has a ways to go to get to that point, and its questionable if it ever will right now. which means our currency rely on USD(a basket of a lot of foreign currency now). In this case ,do you think our gov still can spend whatever they want?